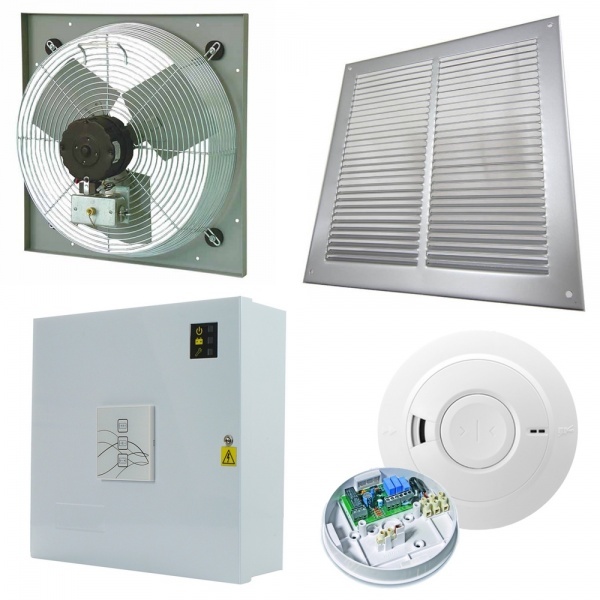 Atex rated Explosion Proof (Ex)Heavy Duty Industrial Ventilating Extractor fan With the grill and the louver Shutter for safety & to stop the draft coming from outside , the louver shutter only opens when the fan is extracting the air. The fans are designed for industrial, commercial and farming application with the robust metal construction. The application of the fans are in Hazardous location required in any area where the presence of flammable gases, vapors or finely pulverized to dust in the atmosphere , The fans are very commonly used at spray booths and factories to extract the flammable fumes. This smoke control panel has been especially designed and developed for smoke ventilation systems, and can be used for stand alone operation or as part of a BRE shaft system. The panel comes complete with two 24V reverse polarity outputs with a shared output of 2.0A, inputs for daily ventilation switches, wind/rain sensors, smoke detection and fire alarm/BMS. Battery back up is supplied as standard. The innovative design provides a programmable facility (via DIP switches) for limited ventilation (used on day-to-day ventilation to prevent AOV windows opening fully) and timed openings used in conjunction with a thermostat for corridor cooling.